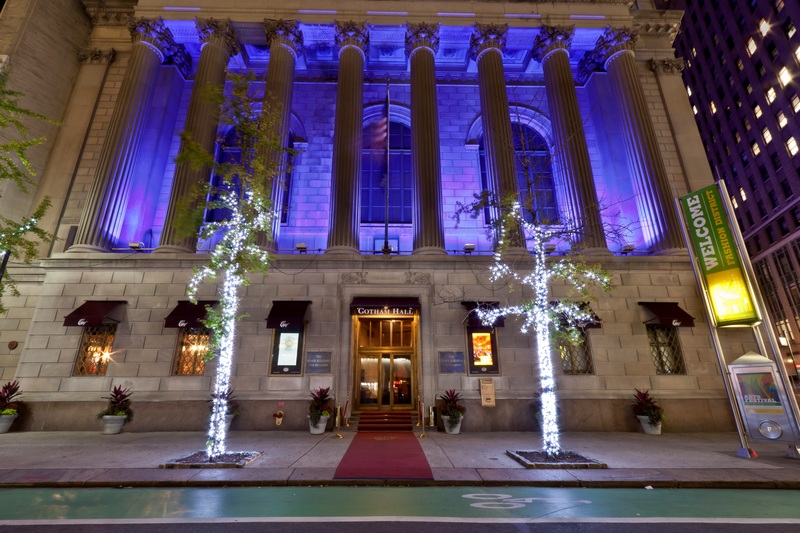 Join 700 leading bankruptcy practitioners and bankruptcy judges from New York and around the country at the Duberstein Bankruptcy Moot Court Gala Awards. One of the major social events of the New York-area bankruptcy bench and bar, this year’s redesigned event promises to offer more time for informal networking in a new setting as we celebrate the next generation of insolvency professionals. The Gala Awards is the culminating event of the annual Duberstein Bankruptcy Moot Court Competition, sponsored by the American Bankruptcy Institute and St. John’s University School of Law. More than 50 law school teams participate, making this the largest single-site appellate moot court competition. ABI provides $12,000 in cash prizes to the top teams and individuals. Learn more about the competition at www.stjohns.edu/law/Duberstein. Originally constructed between 1922 and 1924 as The Greenwich Savings Bank, the building currently known and admired as Gotham Hall was built to serve as the bank’s headquarters with a prominent midtown address. Featuring an architectural design by York and Sawyer and among the most impressive buildings in all of Manhattan, Gotham Hall sits at the intersection of 36th Street and 6th Avenue. The interior boasts Corinthian columns, granite walls, marble flooring, inscriptions and antique attributes symbolizing wisdom and commerce, topped by a domed ceiling with a 3,000-square-foot stained glass skylight. After surviving decades of American history, by 2000 this historical landmark had transitioned into the most prestigious place to host a sophisticated affair. Take in the stunning architecture and classic character of this historical structure while enjoying cocktails with colleagues at this iconic New York City building. Become a sponsor of the Duberstein Bankruptcy Moot Court Gala Awards and support tomorrow’s professionals. Available packages are listed below and on the COMMITMENT FORM. Exclusive sponsor of gift bag given to all attendees. Includes 6 tickets, full-page program ad and premium firm logo projected on wall at event. Sponsor to provide gift, to be approved by ABI. Includes 4 tickets, full-page program ad and premium firm logo projected on wall at event. Includes 2 tickets, signature drink at event bar, and firm logo projected at event. Includes 2 tickets, half-page program ad, and recognition at event. Includes 1 ticket and recognition at event. Please contact Bethany Spencer for more information. The gala program will be distributed to all reception attendees. Congratulate your alma mater, fete a specific team or individual, or show your general support for the talented competitors by purchasing an ad in the commemorative program. Please contact Bethany Spencer to purchase an ad. Journal Page Size: 6.5" x 9" with a .0625" border around each ad. Ads should be submitted to Bethany Spencer as soon as possible after purchase. The final deadline for inclusion in the printed program book is Monday, February 11, 2019. No ads can be accepted after this date. Complimentary. You will be registered by ABI staff. *Rate increases to $350 on day of event.